Preserved lemons, common to some Middle Eastern cuisines, add a broad, rich spectrum of flavor to this simple soup. You may make your own lemons in a salty brine, or purchase them ready made (but make sure they don't have preservatives if you buy them). This soup is topped with a crispy potato "pancake" which provides a delightful contrast in texture and flavor to the soup. In a medium saucepan heat 1 tablespoon olive oil over medium heat until hot, but not smoking. Add the onion and toss to coat with oil. Reduce heat slightly and cook, stirring frequently, until the onion is translucent, about 8 minutes. Add the diced potatoes and cook, stirring often, for about 2 minutes, until they are lightly coated with oil and well combined with the onions. Stir in the water, cover and bring to a boil, then reduce heat to a simmer. Meanwhile, drain the preserved lemon. Cut it in half lengthwise, then into thinner slivers and then cubes, removing all seeds. Add this to the soup along with the salt and pepper, stirring to blend. Continue to cook the soup covered, and stirring occasionally, until the potatoes are very tender, about 25 minutes. Remove the soup from the heat and cool slightly, then in a food processor or blender puree to a smooth texture. (The lemon is pureed along with the soup). Taste and adjust the seasonings. The soup may be prepared up to 5 days in advance if refrigerated in an airtight container. To serve, warm the soup to piping hot. Meanwhile, peel the russet potato and either shred it in a spiralizer, or grate it. In either case, immediately transfer the shredded potato to a strainer and rinse under cold running water to remove the milky starch. Place the potato on a clean kitchen towel and pat dry. In a large skillet heat the remaining oil over medium high heat. Gather small mounds of the potatoes together by hand, squeeze out water and then place the rounds of potato in the hot skillet. Flatten each round with the back of a metal spatula and cook, turning carefully several times, to lightly brown both sides of the “pancake.” Set these aside on a kitchen towel to drain as you cook all of the shredded potato. You should have at least one “pancake” as a garnish for each bowl of soup. You will probably have extra, so serve these separately alongside. Top each bowl with crisp potato and serve immediately. We’ve been experimenting with both gluten and gluten-free recipes, given the increased sensitivity to gluten and wheat that seem to be springing up these days. (Lots of thoughts on why and what to do about it!) But there are still those among us who are fine eating wheat. So we’ll post a gluten-free banana bread another time. In the mean time, this recipe is a great way to use up those couple of bananas that are about to get away from you from the bunch that ripened too quickly. You may use all honey, all maple syrup or a mixture. You may also use agave nectar, brown rice syrup etc. for all or part of the sweetener. I find that a mixture of liquid sweeteners is best. Preheat oven to 375 F. Place the butter in an 8x5 bread pan and place it in the oven until it is fully melted. Combine dry ingredients in a mixing bowl and stir well. In another mixing bowl, whisk together eggs, sweetener, milk and vanilla. Mash the bananas and squeeze the lemon juice over them to prevent oxidation. Add the bananas and melted butter into the egg mixture. Gently stir the wet ingredients into the dry ingredients. Mix thoroughly, but do not over mix or the bread will have holes in it and will puff up in the middle. Pour the batter into the bread pan (make sure the butter has coated the bottom and sides of the bread pan before adding batter. Use a little extra butter if needed). Place the banana bread in the middle of the preheated oven and cook for about an hour. A skewer inserted into the center of the bread will come out clean when the bread is fully cooked. Remove the pan from the oven and cool on a baking rack for about 5 minutes. Loosen the bread from the sides of the bread mold and turn out to cool completely on the baking rack. Store in an airtight container. Freezes well. These days with kale having possibly peaked in popularity and cauliflower rushing to claim its spot, the tiny cabbagelike vegetable that used to be relegated to holiday meals alone is waiting in the wings to be the next in the Brassica Olracea family to be adored. In this recipe, the flavor of mustard complemented by a touch of garlic and mellowed out by butter (or coconut butter for vegans) giving the dish an inviting aroma and irresistible flavor. Trim the tough ends from each Brussels sprout, discarding any damaged leaves as well. Using the tip of a paring knife, poke an X-shape into the end of each sprout so that it will cook evenly. If the Brussels sprouts are large, instead of scoring the base, cut them in half. Rinse trimmed vegetables well. Bring the stock to a boil in a large skillet. Add the Brussels sprouts and return to a boil. Cover the pan and cook, tossing the Brussels sprouts around in the stock occasionally, for about 5 minutes. Using a garlic press, add the garlic to the pan along with the mustard and sweetener. 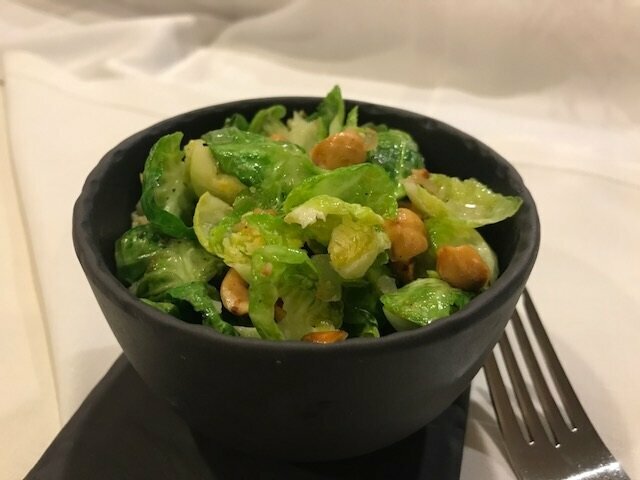 Reduce heat to medium and continue to cook, tossing occasionally, until the Brussels sprouts are tender, about 12 to 15 minutes. Most of the stock should have been absorbed or evaporated by this time; there should be just enough to cover the bottom of the pan. Remove from the heat and gradually add the butter, tossing the pan to allow it to thicken slightly as it combines with the stock, working in enough butter to to coat the Brussels sprouts with a delicate glaze. Dhokla are a fast and simple stand in for idlis. Made from chickpea flour (besan), they can be ready from start to finish in under an hour. Delicata Squash—the small, striped oblong winter squash—is full flavored and sweet with a delicate texture. It is delicious simply baked and served with no extra flavoring or adornment (and we’ve got a recipe for that), but also combines beautifully with pumpkin in this creamy soup recipe. Preheat the oven to 350 degrees F. Wash the squash, pumpkin and yam under cold running water, scrubbing them well to remove any dirt that may be clinging to their skin. Place the vegetables on a shallow baking dish and bake until juice begins to seep out of each and each is very soft tender when squeezed. The time will vary for the different vegetables. Usually the delicata and yam cook a little more quickly than the pumpkin. When tender, remove from the oven and cool. The vegetables may be cooked up to 3 days before proceeding with the recipe. Cut the squash and pumpkin in half and discard the seeds. Scrape the meat into a blender or food processor. Peel the skin from the yam and add the meat to the blender as well. Puree until smooth and even in texture. Transfer the puree to a 3 quart saucepan. Stir in the broth, ginger, rice syrup, salt and pepper. Bring the soup to a low simmer and cook, stirring frequently, until the ginger is soft and the flavors have married. If desired, thicken with a small amount of cornstarch or arrowroot dissolved in cold water that is stirred into the soup before cooking an additional 5 minutes. Remove from the heat, taste and adjust the seasonings. Stir the pumpkin seed oil or olive oil into the soup. Ladle into serving bowls and garnish with the pumpkin seeds. Serve piping hot.